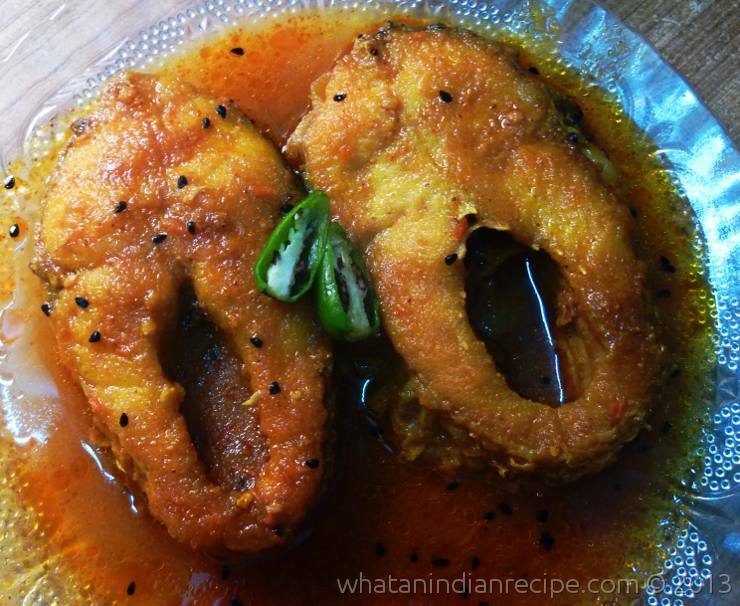 Kaalia is a very popular Bengali style of fish curry with thick gravy& moderately spicy, must for every Bengali & tastes best with steamed rice.It would taste best when mustard oil is used. Marinate the fish pieces with 2 tsp turmeric and required salt. Fry the fish pieces lightly (do not fry to much) and keep aside. Meanwhile make a paste of Onion, ginger and garlic. Heat 2 tsp oil in a kadhai and splutter the kala jeera and then add sugar and the onion-ginger-garlic paste. Fry this masala for 4-5 minutes and then add a pinch of turmeric, chilli powder and green chillies. Saute again for 2 minutes. Now Add the tomato and salt and mix well. add required water to get the required consistency (do not add too much water). Add the fish pieces and cook for 2 minutes. Check seasoning and garnish with chopped coriander leaves. Serve hot with steamed rice, dal and aloo bhaja.